BREACH is another true story of deceit, hidden lives and thwarted glory. Chris Cooper (Oscar winner for his supporting performance as an orchid thief in Adaptation and totally deserving of more awards for his performance here) is absolutely chilling as Robert Hanssen, the master spy who sold American secrets to the Soviets for 30 years and engineered the greatest security breach in US history before the Feds finally managed to out him in 2001. Hanssen is no easy charmer like the Clifford Irving character in The Hoax. He is a middle of the road civil servant, a holier than thou, church going dude with a crucifix in his office and a dagger in his heart from having been passed over for promotion for so many years. Heâ€™ll teach them to pass over a genius. And so he becomes the worm burrowed deep in the shiny apple, eating away at the FBIâ€™s computer networks, giving up American agents, and somehow justifying his choice as a necessary tough love lesson for a system that has become so blind to its own failings. Most of the action in BREACH is small. There are no mind-blowing car chases but director Billy Ray has crafted a truly nail biting thriller (Rayâ€™s first film, SHATTERED GLASS, was another great tale of escalating deceit set in a newsroom. RENT IT!). In fact, Iâ€™ll pay him the ultimate compliment: There were moments where the tension in BREACH was reminiscent of an Alfred Hitchcock classic. 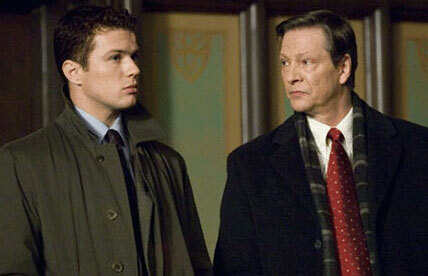 I genuinely feared for Ryan Phillippeâ€™s well being at several points! Two fascinating side bars: Socialite Nina Van Pallandt, Clifford Irvingâ€™s mistress and one of the people who betrayed his Howard Hughes scam to the authorities, ended up as a minor movie star in the after glare of the scandal, appearing with young Richard Gere in American Gigolo in 1980, and Eric ONeill, the real life character Ryan Phillippe portrays in BREACH, resigned his promising FBI career shortly after Hanssenâ€™s arrest. He had seen enough!